We stayed in Alameda Palace Hotel in Salamanca city, it is just about 300 meters from the center of Salamanca. 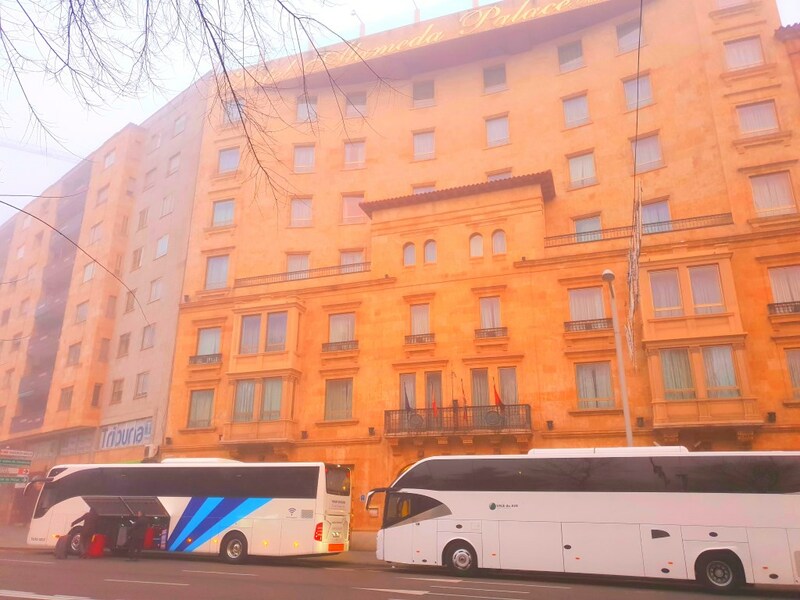 After we visited the Plaza Mayor of Salamanca, we went back to our hotel for our dinner. When I first entered the hotel lobby, I felt the decor were old fashion but that doesn’t mean it is old and dirty but they actually look very new and elegant. The hotel comes with free wifi access and air-conditioned rooms. Dinner was held in the Venecia restaurant of Alameda Palace Hotel, we were told we will be having fish for our dinner. First, there is a nice table setting and it is not a casual tapas dinner but a real Spanish dinner. The dinner started at around 8.30pm which is quite late for us but very early for the Spaniard as they usually have their dinner at 9 pm plus. The dinner is not a buffet style which is a lucky thing for us as we were so tired. It is always nice to have waiters to serve our dinner at our table. The first dish is some cooked vegetables which include carrots, green pea, onions and little of ham. I won’t say it tasted very yummy as the vegetable is overcooked for my standard. The main course is fish and a prawn in tomatoes sauce. I have nothing much to review on this main course I felt it is quite a blunt taste for me. I tasted quite a few times of Flan dessert during my stay in Spain. The dessert is similar to an egg pudding and covered by melted caramel flavor. There is a slightly burnt taste which I quite enjoy. I was surprised at the hallway which is decorated with many artwork painting and old antique furniture before entering our hotel room. The floor is also in wooden flooring both in the hallway and in the hotel room which makes the place very cozy. The hotel room is quite spacious and decorated with elegantly framed painting and mirror. The furniture inside the room also looks a very rustic taste of European style. A comfy bed and plenty of space to put your luggage. Extra pillows are available inside the cabinet and there is a safe box. The glass bathroom is very beautiful and looks super classy as the whole wall and floor are marble. Again, the big mirror at the top of the double basin is framed elegantly. There is also an additional magnifying mirror for me to do my make up which I quite appreciate. This is the first time for me to encounter a bidet which looks like a low sink in the toilet. The bidet is for you to wash the lower body and usually can be found next to the toilet bowl. The purpose of the bidet is to help you better clean off after toilet use. I think the Japanese one-touch electronic toilet (which include the function of bidet wash) is better and so smart! It is also easier to use as you do not need to hop from one toilet bowl to another and do not need to use wet your hand at all. The Japanese toilet is fully automated, there are buttons for water level and warm of the water, etc. Some painting and old furniture in the hallway. The breakfast variety is good enough for me as compared to my hotel in America and the UK. This one here has got more pastries and more choice of ham. This is an unusual dish for me, found them usually in dark brown color and tasted sweet and feel like a thick jelly. It is made of the pulp of the quince fruit and common confection in Spain. Traditionally it is from the Iberian Peninsula. You can eat the quince cheese with a toast. Have you tasted them before? Yes, you will find the Jamon (Spanish ham) at the far right. It looks like the Spaniard love olive oil so much and you can see it everywhere! They use it to dress a salad or add flavor to your toast at breakfast. Olive oil has been flavoring Spanish cuisine for more than 3,000 years so you cannot find a dish that is without a few drops of olive oil in it. Chinese from mainland love hot water and it is a well-known fact, they bring along their hot thermal flask around when they travel. So you see the hotel in Europe usually charge for hot water. There is no kettle in your hotel room so if you really need hot water, you can pay 2 euro to fill up your thermal flask. There is an underground garage so if you are driving you can park your car there. It is not free and there is a fee to pay for overnight parking. It was still very early so you don’t see any cars and people. Within 2 minutes of walking, there is a Chinese restaurant and a travel agent. Some shops around the hotel but most are closed as it was before 8 am. There is a park opposite the hotel and I see early joggers already started their early exercising at the park. An old gas station is located very near to the hotel, in case you need to fill up your gas, you know there is one next to the hotel. I love the hotel old fashion decoration and enjoyed most of the paintings and artwork & old antique furniture in the hallway and hotel room. The restaurant looks very classy but the dinner meal did not seem to taste as good as the hotel decoration. The breakfast choice is great and love their hot pastries and also glad to learn about Quince cheese here. This place has a nice breakfast. I love that it also has a bidet as my tushie prefers that. Wow, what an amazing hotel. I’d love to stay here. I really like the decor. The hotel decor is fantastic, old rustic feel of European style which I don’t get to see very often in Asia. I was really considering, after 11 years of returning to Spain, but I lost the pulse of the hotel and the situation of accomodation and this hotel seems perfect! What a gorgeous and enchanting place to stay! I mean, Spain is beautiful in general but, this hotel makes it even better. The decor in this hotel are truly beautiful, I love the paintings and antique furnitures in this hotel. This looks like such a fancy hotel. I would love to go to Spain one day! There are just too many reason visiting Spain! The food, the culture, the beaches, architecture and the shopping! The place look pretty fancy but very nice. I like the kind of an old soul interior it has. This is a good recommended place to stay. I too love very much the European old soul interior which we cannot easily find in where I stay in Asia. We only get to see in the movie. Just the name itself, Palace Hotel makes you know it’s bound to be grand. I love the interior and bathrooms. I have to agree with you too, I love the bathroom as the floor and wall are all marble, look quite classy and neat to use. I am not sure Spain has the nicest wine as I don’t drink too much but I can tell you that they have the cheapest wine. Wine is cheaper than soft drinks and water, only about 1.5 to 2 dollar Euro. Spain is on my travel list for the next few years! This looks amazing and the meal looks delicious! I am glad you have plan to visit Spain and hope you enjoy everything in Spain, this is the place for foodies so don’t miss their tapas bars! I love the decor of the hotel, rich but comfy looking. And, after staying at a hotel recently that didn’t offer breakfast at all having so many choices is great. Yes, the breakfast spread was not bad, especially their freshy bake pastries. Wow! This is so beautiful! I love the rooms, the food and the place, stunning photos! I love this hotel! The hotel is also very near to Salamanca city center, Plaza Mayor! This is a beautiful hotel! ANd the bathroom is simply gorgeous! It definitely looks like a great place to stay on vacation.